I ran across the fact that the important American artist Thomas Hart Benton lived and painted in a house that was next door to FLW's Sondern House. Benton moved into the house in Kansas City in 1939 and lived there until his death in 1975. Wright designed the Sondern House in that watershed year of 1939, with its construction taking place in 1940. 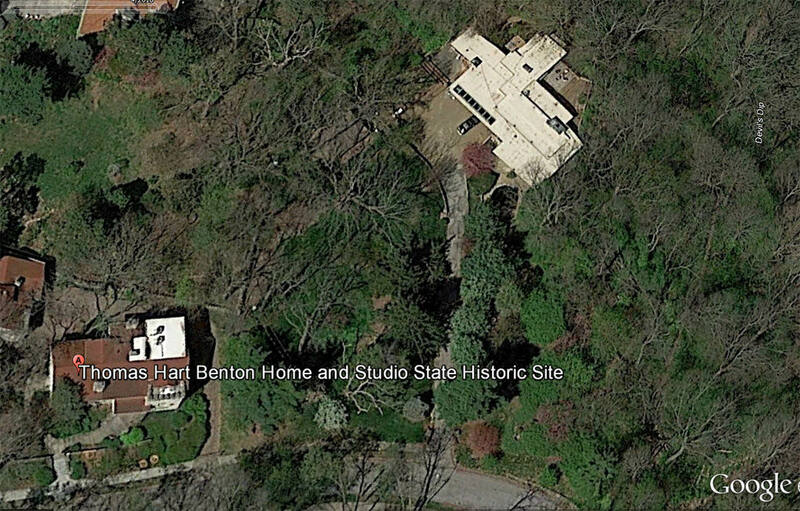 A wikipedia article says Wright spoke with neighbor Benton, offering to design for him a new studio. I recall reading an account of a Taliesin Fellowship evening at the Sondern house soon after its completion in 1939-40....not sure which book it was in, possibly Besinger's. The Fellowship, Wright included, ate dinner with the Sondern's then the Felowship and their hosts walked over to Thomas Hart Benton's studio for drinks and further conversation. Speaking of the Clarence W. Sondern's, I recently learned that after they sold their FLW home in Kansas City in the later 1940's, they moved to a small farm in the hamlet of Bernardsville, NJ to be closer to New York City. One wonders if the Sonderns knew of the Christie house in Bernardsville which was built at the same time as their Wright house in KC. The Christie's sold their house in 1949.
fitted into the living room for dinner." Elsewhere, Besinger notes that Jack Howe supervised construction of Sondern.